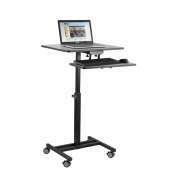 Students and professionals need a proper work surface in order to accomplish their daily tasks. Having functional and durable desks transforms a classroom or office into a productive workspace. With Hertz Furniture&apos;s office desks and student desks, you can find the size and style you need. What kinds of desks are there? There are executive desks from office furniture collections and school desks built with durable materials and functional features. All of our models come from leading school and office furniture manufacturers, and many even include a complimentary extended warranty. What is the best desk for a classroom? Choosing the ideal classroom desks can be quite a feat, considering all of the options and factors that must be considered. The best desks depend on the classroom layout, budget and students. The most budget-friendly desks feature laminate desktops, which have basic damage resistance but might lose their lustre after many years of classroom use. Hard plastic desktops are incredibly durable. Academia's exclusive WoodStone desktops offer the same damage resistance as hard plastic, but they cost and weigh significantly less. The basic desk design provides a surface on which students can take notes and do assignments, but there are a number of additional components that can help everyone's day run more smoothly. Built-in bookboxes under the work surface enable students to keep everything they need close at hand. This will save the time and hassle of rummaging through backpacks during lessons or running back and forth to lockers to retrieve forgotten items. If you want to make sure that your school desks will stay in shape, U-braces can be quite helpful. This small piece of added reinforcement wraps around desk legs to ensure many years of sturdy standing. For a colorful desk enhancement, try our attractive line of Educational Edge school desks. A hint of extra vibrant hues will brighten up your study space, creating a more inviting learning atmosphere. What are the benefits of combo desks? 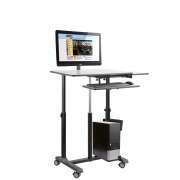 More and more schools are choosing the super-convenient chair desk option. Combo desks include an attached school chair and work surface, so you can be sure that desk and seat heights are perfectly proportionate. With this option, it is easier to line up and arrange classroom furniture and keep the space looking neat. How do I choose an office desk? Whether you are a teacher, student or administrator, everyone needs a comfortable space to work in. Once you have chosen the proper surfaces and arrangements for the children in your school, it is time to move on to the teacher's desk and the principal's office. Like any other executive, a school principal needs a classy work space that projects competence and professionalism. The first step to achieving this effect is by furnishing the work space with an attractive office desk. From company president to entry-level intern, every professional works better when they have an accommodating space arrangement. Office desks come in the basic rectangular arrangement as well as u- and l-shapes. The basic design will work for someone who only needs a computer and a few papers accessible. However, high-level executives need more space for additional equipment. Pedestals provide box and file drawers so office supplies and important documents can be stored right in the desk. The right combination of drawer configurations will depend on what field a professional is working in and how they like to arrange their office. Many of our office desks come from full furniture collections so they can be coordinated with credenzas, hutches and other pieces for a fully-matched space. There are quite a few special features which can make a work space even more attractive. Wire-management grommets make it easy to route cables away from the desktop, so the surface remains clutter-free. Reception desks come with raised transaction counters which enable administrative assistants to have a more private work area within an open waiting room. Quite a few of our office desks have attractive accents such as edge detailing, stylish drawer pulls and more. At Hertz Furniture, we know that everyone works better when they have a large work surface and accessible storage. Our office desks and school desks are designed to make your days as pleasant and fulfilling as possible. We are happy to help you design the ideal space and furnish it with the best furniture out there.